Industrialization led to the development of sedentary life style. One of the consequences of this type of life style was obesity and overweightness that are the major risk factor for various diseases including cardiovascular and diabetes. Obesity alters mitochondria function and is a risk factor for diabetes type 2, heart disease, blood pressure, and cancer to name a few. Fat tissue functions as a secreting organ. In addition, it is a rich source of energy, isolator, protector of internal organs versus impacts, and releases an active biological substance called adiponectin. Overweightness is a condition associated with the accumulation of excessive fat in the fat tissues. An indirect but valid index of overweightness is the calculation of body mass index (BMI). This index (BMI) is calculated by dividing the weight in kilogram to the square of height in meter. The World Health Organization considers the ratio of 25–29.9 as overweigh; above the 30 ratio is considered as fat for the individual over the age twenty. Among the various types of adiponectin, resistin known primarily as the factor leading to resistance to insulin is considered as a significant mediator between obesity and inflammation process. Resistin is a peptide-like hormone that belongs to proteins family with enriched carboxyl ending from systein called resistin-Like molecules found in inflammatory zones and contains 109 amino acids and is involved in resistance to insulin, inflammation, and atherosclerosis. By interfering in glucose and fat metabolism, resistin increases the risk of atherosclerosis. In addition, by activating preinflammatory agents, it increases the risk of susceptibility to atherosclerosis plaque. This substance has a direct association with the level of C-reactive protein (CRP). CRP is a member of pentroxy family that is built in response to accumulation of inflammatory cytokines (another name for adipokine) by the liver and fat tissue., It is also an index of sensitivity and nonspecific inflammation index, and in causing chronic inflammatory diseases, it plays a role. CRP is one of the plasma proteins that is produced in the liver, and its increase is a response to infectious diseases, inflammation, or tissues damages. The presence of 1 mg/l CRP in blood is an indication of low risk, whereas the level of I to 3 mg/l indicated moderate and above 3 mg/l is considered as high risk in adults. One of the most significant causes of CRP production is obesity. The level of CRP serum in healthy individuals is low, but it can increase up to 100 times in acute diseases. Despite the fact that this substance is produced in liver, the result of new research indicates that it can be produced in the blood vessels intima layers too. In general, there are strong evidence that indicate the level of inflammatory factors is positively related with fat tissue probably due to the higher level of cytokines secretion in obese individuals. Lowering the level of fat tissue brought about by participation in physical activities is the most preferred way of preventing the incidence of fat-related diseases. Regular physical activities result in metabolic changes within the muscle and fat tissue and consequently uses fat stored in fat tissue instead of storing it. The result of research in this regard indicates that change of physical activity pattern is associated with a change in the serum level of inflammatory agents. Aerobic activities are usually employed to evaluate the effect of physical activity on fat decrease. Recently, it has been demonstrated that combining aerobic training with resisting training program results in improvement of endothelial function and blood flow in active muscle. Thus, the concurrent training program (resistance and endurance) leads to dual benefits of aerobic exercise as well as resistance training. Resistance training programs are the type of program in which muscles contract against a resisting force including dumbly, weights or an object and results in increase of power and muscle mass. The result of a study demonstrated that regular training has a significant anti-inflammatory effect and results in a decrease of the inflammatory level. An effective training program needs to be adequate in intensity, duration and frequency and type of activity to induce overloading effect on different body systems and cause adaptation. Since physical activity results in fat losses, adopting an active life style may results in decrease the level of inflammatory markers released from fat tissue. The research result about the relationship between exercise and resistin and glycemic index have not produced unanimous results while Giannopoulou showed that 14 weeks of aerobic training program did not result in significant alteration of resistin and sensitivity to insulin; Jones showed that participation in 8 months of aerobic exercise program resulted in significant decrease of blood resistin level and no significant change in resistance to insulin in overweight young adolescents. In addition, Tofighei et al. concluded that 3 months of aerobic exercise resulted in an increase of resistin level. Prestes showed that 16 weeks of resistance training program resulted in a decrease of resistin level, Donges compared the effect of 10 weeks of aerobic versus resistance training program and reported a significant decrease of CRP level in sedentary individuals only for the resistance training program. Jorge reported that 12 weeks of aerobic, resistance, and concurrent training programs resulted in significant decrease of CRP in all three groups. Considering the controversial findings in regard to the effect of aerobic and resistance training on inflammatory markers, it seems necessary to conduct more carefully designed research in regard to the effect of endurance and resistance training programs concurrent or separately. Therefore, this research was designed to examine the effect of 8 weeks of concurrent endurance and endurance training on the level of inflammatory markers of resistin and CRP in sedentary, overweight women. This was a semi-experimental research in which 36 healthy women with no history of smoking, alcohol use or chronic disease including metabolic syndrome, diabetes, or cardiovascular complaints with BMI over 25 were randomly assigned into three equal groups (n = 12) of aerobic, resistance, and concurrent exercise groups. The participants were volunteers and signed human consent forms. All the procedure and objectives of the research protocol were explained to them. The training program included 8 weeks of exercise performed with 55%–75% of 1-repetition maximum weight lifting, aerobic exercise performed at 55%–75% of maximum oxygen consumption and combination of the two programs for 3 days/week. The exercise programs were performed on Sadi gymnasium of Shahr-e Kord every other day under the supervision of qualified coaches. The resistin and CRP serum blood level of the participant was measured 48 h before the start and again 48 h after the termination of the exercise protocol. Physical Activity Readiness Questionnaire form was employed to assess the health status of the participants. Weight and height measures recorded by employing digital scales; weight and hip circumferences were measured by flexible tape. Body fat percentage was measured by Harpenden caliper while serum resistin level was assessed by BOSTER kit made in U. S. A. designed for human sample. Immunotronic method was employed to measure CRP blood level with BIONIK kit for human sample manufacture in U. S. A. and immunometric assay method. All the blood samples were collected in pathology laboratory 48 h before the start of the exercise protocol and 48 h after the termination of the program. Ten cubic centimeters of blood from left-hand ulnar vein was centrifuged and following serum isolation, the sample was kept at −30°C for final analysis. BMI was calculated by dividing the weight in kilogram to the square of height in centimeter. All the weights were measure bare footed. VO2max= −11.2872 × (distance covered [mile] × 35.9712). All the exercise activities were performed every other day between the 15:30 pm and 17 three times per week for 8 consecutive weeks. The concurrent training program was made up of aerobic and resistance training exercises. The intensity of the exercise programs was similar to the other two groups, but the volume of the activities was adjusted in sets and aerobic activities. The statistical analysis was performed using SPSS: Pc version 22 and Kolmogorov–Smirnov test was used to check the normality of the distribution. The entire hypothesis was tested at alpha level set to 0.05. The analysis of variance (ANOVA) and paired as well as independent t-tests was used to test between and within group differences. The result of ANOVA test for the physiological characteristics of the participants including age, height, weight, BMI, waist to hip ratio, and VO2max at the base line showed that there was no significant difference among the three exercise groups (P > 0.05). The result of one-way ANOVA indicated that there was also no significant difference between the level of CRP or resistin of the three exercise group at the base line (P = 0.93 and 0.63). The result of one-way ANOVA test on pretest-posttest difference in CRP level indicated that there was no significant differences in the level of plasma resistin of aerobic, resistance, and concurrent training groups after 8 weeks of participation in the exercise program (P = 0.81). These results are shown in [Table 5]. The purpose of this research was to examine the effect of 8 weeks of aerobic, resistance, and concurrent training program on the decrease of resistin and CRP level of overweight and obese women. The result of study showed a significant decrease in resistin level; this finding was in agreement with the result of studies reported by Botero et al., Buyukyazı et al., Prestes et al. and Kadoglou et al.,,,, however, the findings was contrary with what was reported by Tofighei et al., Samedian et al., Jorge et al. and Jamurtas et al.,,, The discrepancy if the findings may be attributed to the differences of time exercise protocol including time, gender, and physiological adaptation due to the participation in the exercise protocol. Prestes et al. stated that the change of resistin level after 24 and 48 h of exercise occurs because of 16 weeks of systematic resistance training program. The authors concluded that resistin may decrease under the influence of type and intensity of aerobic or resistance training program. In such condition, there is a decrease in pre-inflammatory cytokine production through the inherited immune response, decrease in production of preinflammatory mediators by fat and liver tissue and increase of anti-inflammatory mediators released by fat tissue. This decrease in systemic preinflammatory markers is associated with decrease in chronic disease related to menopause. The researcher in this research acknowledged their limitation by the lack of large sample and control group in addition to the 16 weeks of training as too short a period. Kadoglou et al. and Jorge et al. purpose that the lack of significant resistin level change after 12 weeks of concurrent training in menopaused adult women suffering from type 2 diabetes was due to the small sample size and lack of control over the metabolic condition of the participants., They claimed that since resistin level is controlled by the diet type and food restrictions result in decrease of Messenger genes expression, it is likely that the lack of change in this index is mediated by the diet of the participants. Jamurtas et al. stated that the lack of change in resistin level after submaximal aerobic exercise id due to the fact that the level of this hormone changes after several month if exercise. They concluded that acute aerobic exercise regimes do not lead to prolonged change level of resistin in healthy over weight individuals, therefore, exercise does not cause a significant change in resistin level up to 48 h post-exercise state. The result of this research in regard to the changes of CRP level was in agreement with the findings of Dastani et al., Jorge et al., Olson et al. and Mogharnasi et al.,,,, but did not support the findings of Schulze and Busse, Hemmatinafar et al. and Tartibian et al.,, The discrepancy of findings may be attributed to the differences among the groups in the protocol, basic level of the factor and the study design and other factors including type, duration, and the intensity of the training program. In regard to the mechanism leading to the change of CRP due to exercise, controversy remains. It is likely that the adaptation to aerobic exercise is due to the improvement of heart and vessels. This process is directly linked to the increase in nitric oxide released from endothelial tissue that causes improvement in endothelial function and rise of antioxidant factors. The result of this event is the decrease in systemic as well as local inflammation and consequently decreases of inflammatory cytokines from the smooth muscles of endothelial tract. The final product of such changes is the likely decrease of CRP in liver as the index of inflammation. In the other hand, because of improvement in cardiovascular system due to the participation in aerobic exercise, change of metabolic, and improvement of lipolysis process follows. These changes are reflected in weight reduction, body mass, particularly in a decrease of body fat percentage. This later factor is one of the main producers of inflammatory cytokines. The end result of these changes is direct and indirect production of CRP in liver. In addition, a potentially major pathway contributing to these changes may include interleukins. Based on some evidence, considerable the amount of tumor necrosis factor-alpha (TNF-α) and interleukin-6 are released from the fat tissue, specifically from the visceral fats. The release of these factors is increased by the activity of sympathetic pathway and since regular physical activity decreases sympathetic activity, it is likely that it leads to the decrease in secretion of TNF-α and interleukin-6. Dastani et al. conducted a research on 30 menopaused women and concluded that participation in 8 weeks of aerobic exercise three times per week with 50%–60% of maximum heart rate resulted in decrease of CRP. Based on the available evidence reported earlier, they stated that decrease of CRP is directly related with obesity, BMI, waist to hip ratio. Every kilogram of weight loss is associated with 13% decrease in CRP. In addition, fat cells produce interleukin 6 that are responsible for the release of CRP by liver. Therefore, weight loss in addition to decrease in fat percent and interleukin production result in decrease of CRP. These authors also considered the loss of BMI because of decrease in CRP level and concluded that in obese individuals with resistance to insulin, the level of CRP is high and it decreases as they lose weight. Jorge et al. claimed that decrease in the level of CRP is an indication of depression in systemic inflammation induced by physical activity and diet. The result of this study showed that all type of exercise regardless of being aerobic or resistance are effective in decreasing health risk factors and there is no significant differences in regard to their effectiveness. It needs to be mentioned that despite the effort to control the research environment and factors that may interfere with the findings of this research, there were limitations beyond the control of the researcher. To name a few, the daily activities and diet of the participants was not possible to monitor during the 8 weeks of exercises. In addition, personal characteristics of the participants including their motivation to engage in the activities were not matched. Considering the fact that the entire exercising group significantly showed a decrease in the resistin and CRP level of their blood after completing the exercise program, it may be concluded that these types of exercise are appropriate to use in exercise in weight control clubs, rehabilitation center, and diabetic community for their clients. However, further research with larger sample including both gender and controlling diet and daily activities of the type of participants is necessary to make a firm recommendation. The researcher wishes to express her appreciation to the cooperation of Islamic Azad University in conducting the exercise protocol in their facility. Zhou L, Yu X, Meng Q, Li H, Niu C, Jiang Y, et al. Resistin reduces mitochondria and induces hepatic steatosis in mice by the protein kinase C/protein kinase G/p65/PPAR gamma coactivator 1 alpha pathway. Hepatology 2013;57:1384-93. Guyton A. Medical Physiology. Translator Shadan F. 12th ed., Vol. 2. Chehr Publications. 2011. p. 1396. Lubkowska A, Dudzinska W, Bryczkowska I, Dobwgowska B. Body composition, lipid profile, adipokine concentration, and antioxidant capacity changes during interventions to treat overweight with exercise program and whole-body cryostimulation. Oxid Med Cell Longev 2015. p. 13. Available form: http://dx.doi.org/10.1155/2015/803197. [Last accessed on 2017 Jul 15]. Codoñer-Franch P, Alonso-Iglesias E. Resistin: Insulin resistance to malignancy. Clin Chim Acta 2015;438:46-54. Wang H, Chen DY, Cao J, He ZY, Zhu BP, Long M. High serum resistin level may be an indicator of the severity of coronary disease in acute coronary syndrome. Chin Med Sci J 2009;24:161-6. Selvin E, Paynter NP, Erlinger TP. The effect of weight loss on C-reactive protein: A systematic review. Arch Intern Med 2007;167:31-9. Akbarnejad A, Soori R, Bigdeli MD, Sayyah M. The comparison of the effects of intermittent and continuous exercises on general inflammatory markers (Crp and Fibrinogen Serums) of young obese women. Sport Biosci (Harakat) 2014;5:21-33. Bijeh N, Hosseini SA, Hejazi K. The effect of aerobic exercise on serum C-reactive protein and leptin levels in untrained middle-aged women. Iran J Public Health 2012;41:36-41. Hemmatinafar M, Chobineh S, Chopani S. Effects of 6 weeks of high intensity interval training on serum level CRP and fibrinogen of sedentary young men. New Olympic Journal Iran 2014;1:47-57. Achachoei FK, Moradi F, Abaszadegan M. Effects of resistance training on serum interleukin 18 and C-reactive protein in obese men. J Gorgan Univ Med Sci 2014;1:1-8. Nicklas BJ, You T, Pahor M. Behavioural treatments for chronic systemic inflammation: Effects of dietary weight loss and exercise training. CMAJ 2005;172:1199-209. Grediagin A, Cody M, Rupp J, Benardot D, Shern R. Exercise intensity does not effect body composition change in untrained, moderately overfat women. J Am Diet Assoc 1995;95:661-5. King DE, Carek P, Mainous AG 3rd, Pearson WS. Inflammatory markers and exercise: Differences related to exercise type. Med Sci Sports Exerc 2003;35:575-81. Abedi B. The effects of 12-wk combined aerobic/resistance training on C-reactive protein (CRP) serum and interleukin-6 (IL-6) plasma in sedentary men. Yafte 2012;14:95-106. Eves ND, Plotnikoff RC. Resistance training and type 2 diabetes: Considerations for implementation at the population level. Diabetes Care 2006;29:1933-41. Olson TP, Dengel DR, Leon AS, Schmitz KH. Changes in inflammatory biomarkers following one-year of moderate resistance training in overweight women. Int J Obes (Lond) 2007;31:996-1003. Kriketos AD, Gan SK, Poynten AM, Furler SM, Chisholm DJ, Campbell LV. Exercise increases adiponectin levels and insulin sensitivity in humans. Diabetes Care 2004;27:629-30. Giannopoulou I, Fernhall B, Carhart R, Weinstock RS, Baynard T, Figueroa A, et al. Effects of diet and/or exercise on the adipocytokine and inflammatory cytokine levels of postmenopausal women with type 2 diabetes. Metabolism 2005;54:866-75. Jones TE, Basilio JL, Brophy PM, McCammon MR, Hickner RC. Long-term exercise training in overweight adolescents improves plasma peptide YY and resistin. Obesity (Silver Spring) 2009;17:1189-95. Tofighei A, Samadian Z, Zolfagharei M. The response of serum resistin to aerobic exercise and its possible association with metabolic indices in women with type 2 diabetes. Med J Tabriz Univ Med Sci Health Serv 2014;36:18-25. Prestes J, Shiguemoto G, Botero JP, Frollini A, Dias R, Leite R, et al. Effects of resistance training on resistin, leptin, cytokines, and muscle force in elderly post-menopausal women. J Sports Sci 2009;27:1607-15. Donges CE, Duffield R, Drinkwater EJ. Effects of resistance or aerobic exercise training on interleukin-6, C-reactive protein, and body composition. Med Sci Sports Exerc 2010;42:304-13. Jorge ML, de Oliveira VN, Resende NM, Paraiso LF, Calixto A, Diniz AL, et al. The effects of aerobic, resistance, and combined exercise on metabolic control, inflammatory markers, adipocytokines, and muscle insulin signaling in patients with type 2 diabetes mellitus. Metabolism 2011;60:1244-52. Sharifi G, Yazdani F, Shakori M. Lab and field tests in exercise physiology. Isfahan: Khorasgan Unit of Islamic Azad University; 2007. p. 224. Haghighi A, Yarahmadi H, Darabadi A, Rafieepour A. 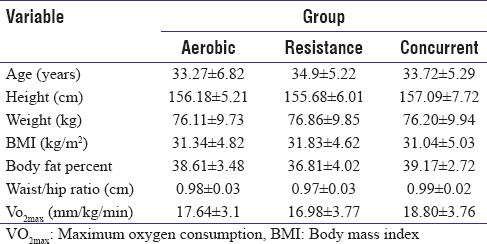 Effect of a period of aerobic training on serum resistin level in obese men. Med J Mashhad Univ Med Sci 2013;56:31-8. Buyukyazı G, Ulman C, Taneli F, Esen H, Gözlükaya F, Ozcan I, et al. The effect of different intensity walking programs on resistin and visfatin levels in pre-menopausal women. Ege J Med 2011;50:87-94. Botero JP, Shiguemoto GE, Prestes J, Marin CT, Do Prado WL, Pontes CS, et al. Effects of long-term periodized resistance training on body composition, leptin, resistin and muscle strength in elderly post-menopausal women. J Sports Med Phys Fitness 2013;53:289-94. Kadoglou NP, Perrea D, Iliadis F, Angelopoulou N, Liapis C, Alevizos M. Exercise reduces resistin and inflammatory cytokines in patients with type 2 diabetes. Diabetes Care 2007;30:719-21. Samedian Z, Tofighei A, Mahdizadeh A. Effects of 12 weeks of concurrent training on resistin serum level and glycemic indices of menopaused diabetic type II women. Iran J Diabetes Metab 2013;12:524-33. Jamurtas AZ, Theocharis V, Koukoulis G, Stakias N, Fatouros IG, Kouretas D, et al. The effects of acute exercise on serum adiponectin and resistin levels and their relation to insulin sensitivity in overweight males. Eur J Appl Physiol 2006;97:122-6. Dastani M, Rashidlamir A, Rashidlamir SH, Saadatnia A, Ebrahim M. The effect of eight weeks of aerobic training on hsCRP and resistin levels in menopause women. Eur J Exp Biol 2013;3:43-7. Mogharnasi M, Bagheri M. The effect of 12 weeks of circuit resistance training on c-reactive protein and lipid profile in inactive women. J Sport Biosci 2014;6:233-44. Schulze A, Busse M. Effects of a 9 months exercise on inflammatory and lipid markers in type 2 diabetic patients. Swedish J Sci Res 2015;2:29-38. Tartibian B, Ebrahimi B, Baghaei B. Relationship between respiratory and inflammatory markers in 14-16 years old active boys: Effects of incremental exercise. Razi J Med Sci 2014;21:69-76. Parsian H, Abrahim KH, Nikbakht H, Khanali F, Parsian F. The effect of 12 weeks of endurance training on serum C reactive protein and plasma fibrinogen as predictors of cardiovascular disease. Pajoohandeh J 2012;17:62-6.